If you’ve been following this column, low-carb is a thing for me. This makes Chanuka a challenge. But I think I’ve solved it with these awesome zucchini fritters. I made potato latkes for the rest of the family and these babies for me, and everyone was gobbling MY zucchini fritters. They’re that good. Note that they call for preserved lemon. If you started a batch when I posted the recipe, they should be ready by now! If not, you should be able to find them in any well-stocked supermarket or Middle Eastern grocery store. The fritters are good plain and even better with sour cream. You can be exotic and have them with salsa, but to my mind, the salsa takes over and you can’t taste the bright but subtle flavors of the parmesan and preserved lemon, and that’s a pity. Enjoy! And have a happy Chanuka. Grate the zucchini on a box grater or with a food processor. Place the zucchini in a colander and sprinkle with the teaspoon of salt. Mix the zucchini gently to distribute the salt and let it sit for about 5 minutes. Squeeze the zucchini out with your hands and place into a medium-sized mixing bowl. Add the eggs and minced scallion and preserved lemon to the zucchini and mix together. Add pepper, baking powder, almond flour, and parmesan cheese. Mix thoroughly. Pour oil into a large skillet to completely cover the bottom surface of the pan. Add a tablespoon or more unsalted butter. Heat skillet over medium heat until hot. Stir batter. Drop heaping spoons of zucchini batter into oil and flatten with back of spoon. Cook until brown on the underside, then turn and cook the other side. 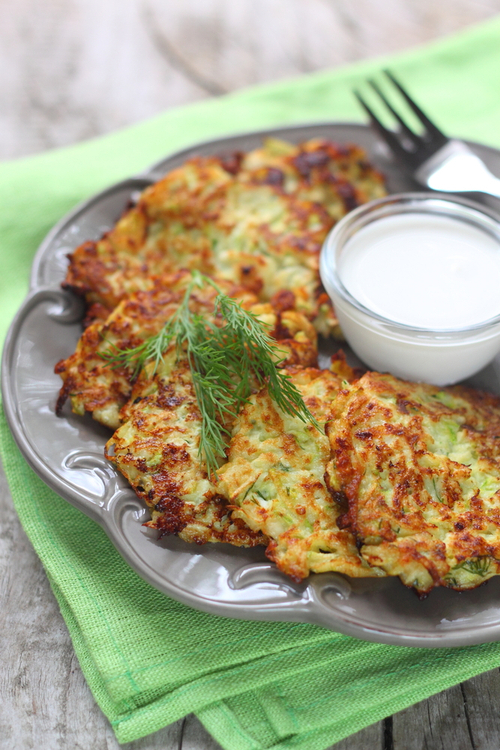 Drain zucchini fritters on paper towels to soak up excess oil. Serve fritters with sour cream.